We told you when iOS came out June 1 to manually troubleshoot brightness experienced by some users, if you jailbreak your best choice. If you jailbreak now there is a better solution. BrightnessFix for iOS 6 just appeared in Cydia to fix problems with auto brightness. In Cydia package indicates that iOS 6 has a problem with the brightness: when you do a respring the brightness level is lowered to the maximum. This is due to a change in brightness management introduced in iOS 6, some say it's a bug. Personally I have this error, and most people I know with iPhone and follow the recommendations to make restorations as new iPhone and set it up with a copy of a previous firmware or previous iPhone model do not suffer these problems. Anyway if you are someone who does have the brightness bug can install this package will fix for free. It seems that the problem may be caused by some specific tweaks that have not implemented some configuration. Because most tweaks not occur. The programmer has released tweak your code for anyone to fix the mistakes of the tweaks you have created for Cydia. 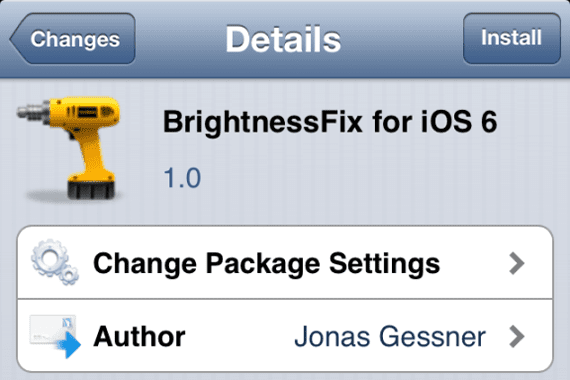 Article BrightnessFix for iOS 6: solve the problems of brightness in iOS 6 (Cydia) was originally published in News iPhone .